Our 50th holiday concert celebrates the gift of choral music — the gift the singers offer, and the gift the audience returns. We will begin with Britten’s A Ceremony of Carols, and continue with cherished repertoire from concerts past, including Nigra Sum and Hanget Soi. Leaping into the present, we will debut two world premieres: Dale Trumbore’s (Winner of the WomenSing’s 2011-2012 Youth Inspiring Youth Composition Competition) Ave generosa, based on the words of Hildegard von Bingen, and Martín Benvenuto’s arrangement of Christina Rossetti’s beloved retelling of the Nativity story, In the Bleak Midwinter. Community is one of WomenSing’s defining values. It helps drive our mission, enhances our musicianship, and creates the unique experience that is WomenSing. 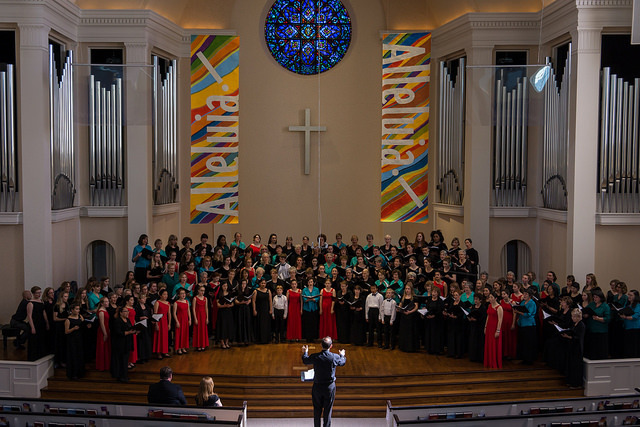 Our recent Treble Voices Now Festival celebrated that value and highlighted the many ways WomenSing, our friends, and our supporters embody it. Our festival artistic team, Youth Inspiring Youth composer, and participating choirs became a community of collaborators, working together to bring a new composition to life. Our adult choirs formed a sympathetic community of fellow singers, brainstorming ideas for meeting challenges and achieving goals. All participants joined the community of appreciative listeners, as each choir shared their individual repertoire at the festival concert. Underpinning it all were the dedicated community of singers, friends, and supporters who made Treble Voices Now 2016 possible. Over fifty volunteers and even more generous donors and sponsors made up that special community. So as we celebrate the success of another Treble Voices Now festival, we celebrate our wonderful and far-reaching community. Our spring concerts give voice to the variety of traditions that have shaped America and WomenSing. The program includes works by William Billings and Aaron Copland, as well as the world premier of our Youth Inspiring Youth commissioned work by Marjorie Halloran. We also honor women who been instrumental in giving voice, featuring the Maya Angelou-inspired Still I Rise, and Alice Parker’s Hark, I Hear the Harps Eternal, in celebration of her immeasurable contribution to choral music in America and beyond. What did “new music” sound like, 10, 25, and 50 years ago? Come hear music from WomenSing performances past, providing a glimpse of the then new American sound.